Three days. Count 'em -- 1, 2, 3. That's how many days I have at home before I leave for the summer. Sometimes it feels like the 2004 season just ended, but in reality, I handed in my uniform nine months ago. Time has really flown by this year, but I'm not complaining or anything. I cannot wait to move in and be a part of a show that has the potential to be the best thing anyone has ever seen or heard in the history of DCI. I'm all packed up and once I find my missing sleeping bag, I'll be ready to go. I can't wait to be with everyone for the whole summer. Three months is a long time, but in drum corps, three months can feel like six or eight months in my opinion. I've had a lot of good friends ageout over the years, but hey, that is life. Paula Hyman and Rick Brown in Bristol, R.I., in 2002.
game, and then Monday and Thursday we will be working in the office during the day, and making calls for a few hours at night. I did it last year, and it's going to be a lot of fun. I'll be back next week to let you know how cold it is in Pennsylvania. Until then, take care and thanks for reading! 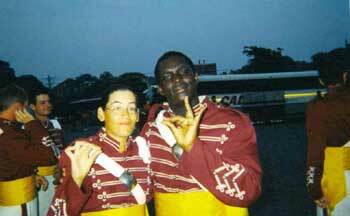 Paula Hyman is a fourth-year member of the Cadets where she is the mellophone section leader. She is 20 years old and currently single. Originally from South Florida, Paula recently made the move to Allentown, Pa., to work for YEA!, the umbrella organization of the Cadets, Crossmen and the U.S. Scholastic Band Association. She ages out in 2006.